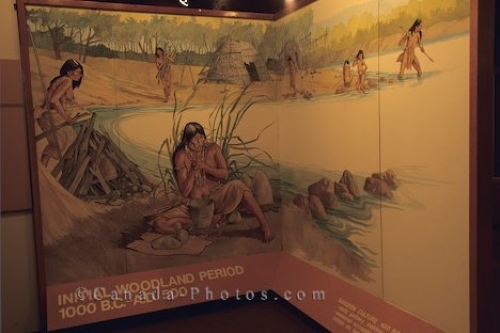 Each wall mural that you see throughout the Mohawk Institute Woodland Culture Indian Museum in Brantford, Ontario relays a different message from a variety of time periods. This wall mural covers the time period of the First Nations people from 1000 BC to AD 500 which was also known as the Woodland Period. Picture of a wall mural at the Mohawk Institute Woodland Culture Indian Museum in Brantford, Ontario in Canada.